A mysterious boy in his teens who first appears to Karin and tries to communicate with her and persuades her to leave her office and go outside. His intentions seemingly is to let Karin remember the world outside and the lullaby her mother sang to her when she was an infant. After accomplishing this goal, he disappears. It is revealed that the boy is codenamed Canary (with no real name) and was called Digma Zero, a prototype to the other Digmas (Mikuni, Kuniko and Kunihito). However he was never allowed to step into the world outside, having lived his whole life inside a facility, and died five years before the start of the series. This information also confirms that Canary lives on as a spirit of sorts. 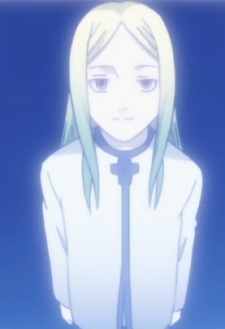 In the profile pertaining to him, his appearance is that of a blonde long-haired youth in a white jumpsuit, and keeps a black cat (which is presumably deceased as well) with a yellow bow tied around its neck as a pet.